Protect your favorite crops from deer, insects, and birds with the Gardman Netting Grow Tunnels. 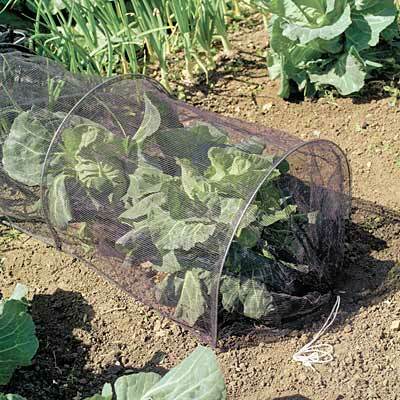 Covering your growing plants with a fine mesh net keeps animal pests from reaching them, for a robust and high yielding garden with fewer pesticides. Metal arches form a frame, supporting the generous, 10' length of fine, black netting. The 20" high arches create plenty of space for crops to grow upward, and the elastic ends and lift-up sides make checking plants simple. The fine gridwork on the netting stops birds and rabbits from reaching the food, while allowing plenty of light and moisture to reach the crops. Use the included ground pegs to secure the tunnel into the soil. Prevent birds and deer from ruining your garden rows with these Netting Grow Tunnels. Note: This case pack contains 8 of the Gardman Netting Grow Tunnels, 20"W x 120"L.